In our culture, artistic genius and poverty seem inevitably linked, but does it have to be that way? Jim Henson didn’t think so. An iconic creator and savvy businessman, Henson is a model for artists everywhere: without sacrificing his creative vision, Henson built an empire of lovable Muppets that continues to educate and inspire—and a business that was worth $150 million at the time of his death. How did he ever pull it off? And how can other creators follow in his path? 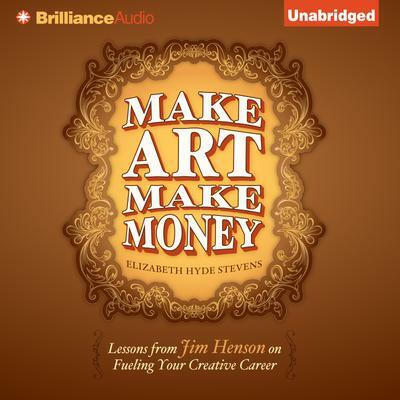 In Make Art Make Money: Lessons from Jim Henson on Fueling Your Creative Career, journalist and educator Elizabeth Hyde Stevens presents ten principles of Henson’s art and business practices that will inspire artists everywhere. Part manifesto, part history, part cultural criticism, part self-help, Make Art Make Money is a new kind of business audiobook for creative professionals: a guide for creating and succeeding thanks to lessons from the Muppet Master himself.